As we settle into back-to-school season, I’m struggling in the morning. I’m struggling to get up on time, to get us both fed, to not yell in frustration, and to get us to school on time (I’ll admit here that I’m flat out failing on that one). 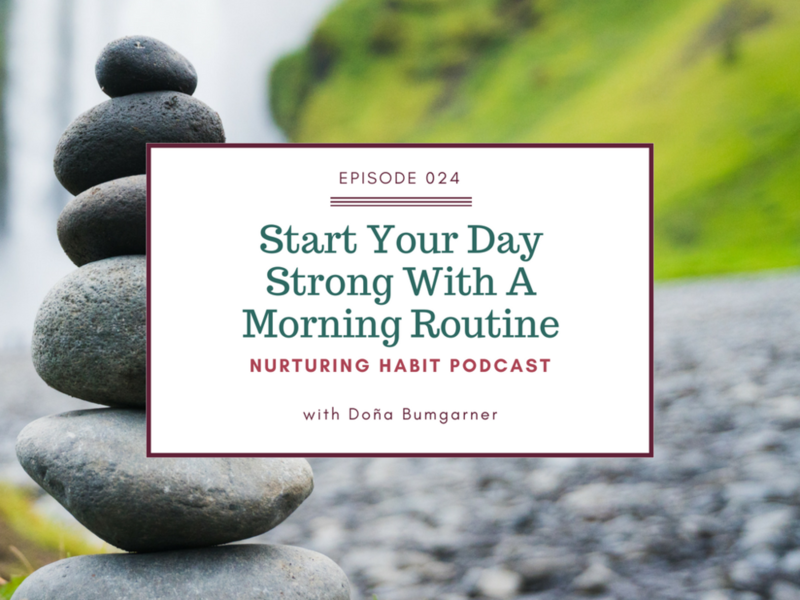 In this episode of the Nurturing Habit podcast, host Doña Bumgarner talks about how to create a customized morning routine that will fit you, your family and this season of your life. This episode will help. This week I dive into morning routines - why you need one and how to go about creating one. But this is not about a one-size-fits-all solution. My awesome morning may not make your morning better at all. This episode is instead about how to look at your life and your needs, and how to customize a plan that will work for you and your family. To get your days started strong and to get you all out the door on time.Listen to Episode 24 now in the play bar below (reload your browser if you don’t see it). Or find the episode in iTunes or your favorite mobile podcast player.And while you are there, will you please leave a rating or a review. That feedback helps more people find the show, and helps me land a greater variety of guests for you to listen to. And I love hearing what you have to say! Sign up for your mini session (free for the first five responders!) - put "morning routine" in the subject line.